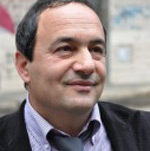 11 June 2010: Believing that a man is a man with or without legal documents, Domenico “Mimmo” Lucano founded Città Futura (The City of the Future) an association in charge of granting asylum to immigrants and refugees from Afghanistan, Eritrea, Iraq, Somalia, Palestine and Lebanon in Riace, Italy, the village he has been mayor of since 2004. Mayor Lucano was awarded third place in World Mayor 2010 and be given a special World Mayor Commendation for compassion and courage. 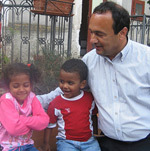 Domenico Lucano was born on 31 May 1958 in Melito di Porto Salvo, Reggio Calabria province. Previously a school teacher, Lucano is Mayor of Riace since 2004 and was re-elected in June 2009 with the Coalizione Lista Civica (municipal list), not a political party but a campaign system mainly at a commune level. Located on a hilltop 300 meters above the sea level, Riace is a small village in the Calabria region, province of Reggio Calabria in southern Italy. Riace has 1,726 inhabitants within its 16 sq km area, a land with wonderful weather and lots of fruit fields, great mountain scenery and the nearby Mediterranean Sea. Yet, in the 60s and 70s its inhabitants began to migrate threatening to leave a ghost town behind. Working closely with the UNHCR (UN Refugee Agency) Mayor Lucano has managed to renovate Riace bringing life to it again, despite the tough Italian immigration policies and the region’s mafia reaction against this. According to Mayor Lucano the transformation of Riace began 12 years ago when a boat pushed by the wind reached the shores of Riace carrying 300 Kurdish men, women and children, “Riace was already dying” he recalls, and although that first group of immigrants eventually went to Germany, Riace continued receiving with open arms all immigrants and refugees that wanted to settle in the village. Lucano founded an association called “Città Futura” (City of the Future) which aims to help the newcomers with free housing and board electricity included, in return they learn Italian and work, men renovate buildings and women make handicrafts. Riace was revitalized. Before the immigrants came to the village there were no shops, restaurants, or any kind of business and the school was almost empty. Since 2004 Lucano began recruiting new residents, taking advantage of a government integration program to bring in refugees who had passed through Italy’s detention system. Now there are all sorts of shops and teachers are being hired. Mayor Lucano is a simple man who works on a worn wooden desk in an ordinary house as office, surrounded by maps of the world, a drawing of Che Chevara and a poster depicting Mexican Zapatista rebels. “Utopia” is Lucano’s favourite word and his highest ideal is: “The poorest of the poor would save Riace, and in return, Riace would save them”. Perhaps what most distinguishes Riace is the fact that in 1972 the famous “Bronzi di Riace” (Riace Bronzes), two bronze Greek statutes of warriors were found under the sea in its shores and which are now being exhibited at the Museo Nazionale della Magna Grecia in Reggio Calabria. But now, thanks to the German filmmaker Wim Wenders’ documentary “Ill Volo” (The Flight) filmed in Riace on the village and its new inhabitants, the village serves as example to the whole world of the purest human solidarity, showing the world that human beings can live together if we just trust and help each other. In a speech in Berlin, where celebrations to commemorate the fall of the Berlin Wall, Wenders stated: “The true Utopia is not the fall of the Wall, but what has been achieved in Calabria, in Riace”. At present, of the 1,726 inhabitants around 250 are immigrants and Lucano hopes that the village will reach its previous level of 3,000 people. However, government funds are not enough, so Lucano’s social integration program is now far from sustainable and he may not be able to take in more immigrants.